Although apparently naked upon its arrival in the gloomy labyrinth of 1984, the Terminator is, of course, already wearing a costume: the layer of flesh and hair covering the titanium bones of its endoskeleton, which allows it to pass for human. Over the course of the film, though, the titular cybernetic assassin procures for itself two further and distinct outfits—suits of fashionable armor associated with a wounded and dangerous type of modern masculinity. Both provide a surprisingly comprehensive, though perhaps accidental, survey of many of the film’s themes: the ripe overlap of industry, technology, dissent, oppression, and warfare, in all its punishing ambiguity. 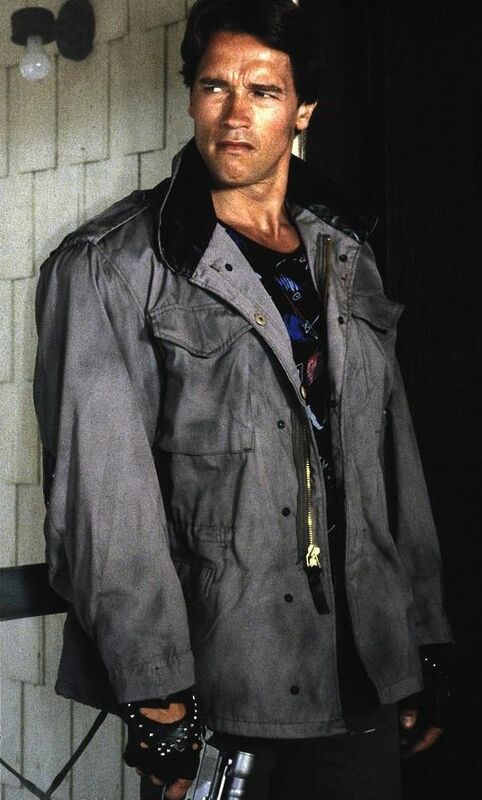 The first time we see the Terminator dressed, it is wearing clothes taken from one of a trio of punks the machine murders after arriving in the present day: a patterned black t-shirt, a pair of cargo pants, leather harness boots, and a customized M-65 field jacket. The M-65 was developed for the US Army by Knoxville’s Alpha Industries as part of a contract with the Department of Defense, and the jacket took its name from the year it was introduced: 1965. Made of an innovative nylon/cotton blend called NYCO, the M-65 featured a hood that could be rolled into the jacket’s collar, as well as a removable lining. With its “Olive Green 107” color and suitability for changeable weather, the M-65 had been designed for subtropical Vietnam, where US forces were engaged in a humiliating war that would see over a million lives pointlessly cut short. 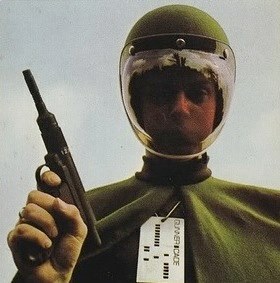 Military stylings have long exerted a powerful influence over popular fashion—in the form of t-shirts, for example, or shoulder pads—but the remaindered articles available cheaply in military surplus stores allowed pieces of actual uniform to be repurposed as countercultural political statement. Military surplus stores had first appeared as a side effect of the industrial mass-production of uniforms, one of the first—founded by Scottish immigrant Francis Bannerman—opening in 1872 and trading in surplus from the American Civil War. After the Korean war, the British Mod movement adopted the M-51 fishtail parka, which had been manufactured in vast numbers for US soldiers, and, in 1964, I Was Lord Kitchener’s Valet opened in London—a boutique that sold military garb specifically as countercultural livery. Returning Vietnam servicemen brought their M-65s back to the States with them, and commercial interest in the garment was soon such that Alpha Industries opened two subsidiaries to handle demand, producing versions in a range of colors including the grey model we see the Terminator wearing. 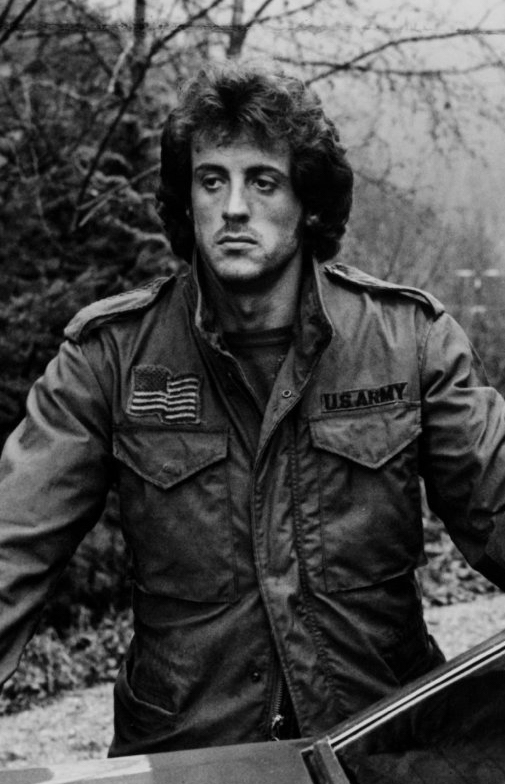 The jacket subsequently made an appearance in two of the films that would contribute most to defining the stereotype of the “Vietnam vet”—the damaged young man struggling with war trauma and the disapproval of an uncomprehending homeland—in the public imagination: 1976’s Taxi Driver and 1982’s First Blood. 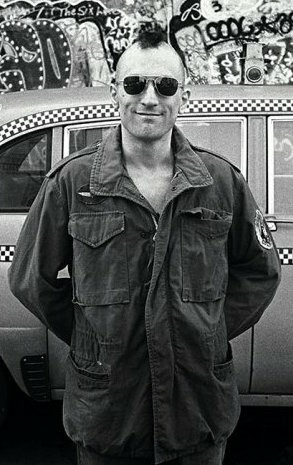 Taxi Driver‘s protagonist Travis Bickle (Robert De Niro) sheds his more innocuous-looking WWI “tanker” jacket and dons an M-65 as he begins his descent into madness, filtering his frustrations and misery through conspiracy theorizing and manifest-destiny machismo (De Niro would play an M-65-wearing vet again in 1978’s The Deer Hunter); in First Blood, John Rambo (Sylvester Stallone) is stripped of his M-65—the symbol of the authority and respect he has earned in the war—by the police officers who arrest him as a vagrant. By this time, in the eyes of the local authorities, grizzled young men dressed in army fatigues might be anti-authoritarian hippies, or punks, or dangerously unbalanced individuals with combat training—and, in all cases, the wearer was considered a threat. The M-65 the Terminator lifts from the murdered punk has been customized with the addition of a leather collar and leather diamond on the back, studs, and chains. Despite the antagonism between punks and hippies, both subcultures often made use of the symbols of the militaristic authority to which they set themselves in opposition, decontextualizing and distorting them, as a way of distinguishing themselves from the norm. But while the hippies used symbols of peace to modify their army surplus clothes, punks often adopted decorations that evoked violence, aggression, and decadence—chains, studs, safety pins—though often with tongue in cheek or simply from a desire to provoke. 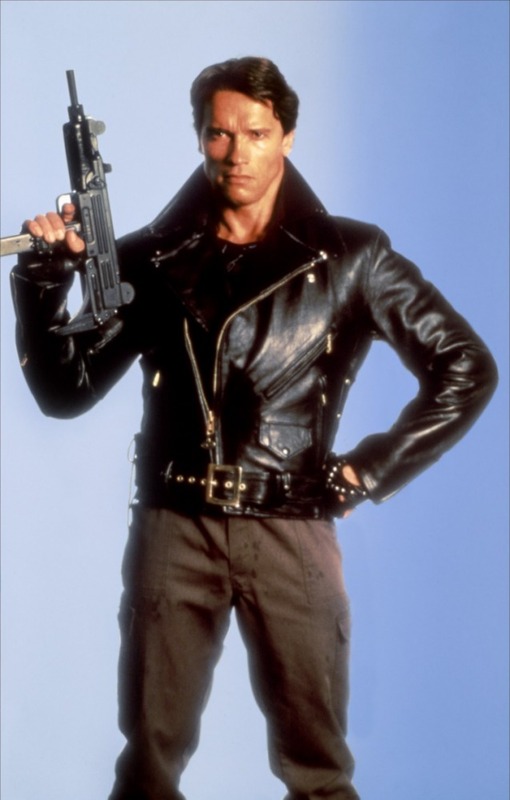 The Terminator’s second look makes its appearance later in the film, when the cyborg launches an assault on the police station where Sarah Connor is being questioned. Now, it is clad in a plain grey t-shirt, a pair of black sunglasses, and a leather motorcycle jacket—more precisely, a Perfecto leather jacket—presumably taken from another unfortunate encountered along the way. The Perfecto was the creation of Schott NYC, formerly Schott Bros., a clothing company founded on the eve of World War I by first generation Russian immigrants Irving and Jack Schott in the basement of a tenement building on Manhattan’s Lower East Side. Released in 1928 and named after Irving’s favorite Cuban cigar, the jacket combined an asymmetrical “lancer fronted” overlap closed with a zipper (the first jacket, they claim, to feature one) to provide comfort and extra insulation. Like Alpha Industries, Schott also supplied clothing items for the US Military, including the iconic B-3 bomber jacket, and uniforms for American law enforcement agencies. The large numbers of cheap motorcycles available the end of WWII birthed a motorcycle culture, whose adherents included many demobilized soldiers returning—like the Vietnam veterans after them—from traumatic experiences overseas, and the Perfecto’s countercultural connotations burst into the mainstream with the release of 1953 film The Wild One. Marlon Brano’s performance and appearance launched the “bad-boy” image, and the script was based on a short story inspired by the 1947 Hollister Riot, where an unexpectedly large number of motorcycle enthusiasts descended upon a rally in Hollister, California. Havoc allegedly ensued, and the National Guard was called in. A Life magazine report about the incident (“Cyclist’s Holiday: He and Friends Terrorize Town”) featuring a photo of one of the supposed debauchees, his bike surrounded by beer bottles—a photo that many, including one of the depicted, insist was posed—ensured that the story made national news. The incident and its fallout spawned the subsequently widespread image of bikers as a distinct and violent group whose moral code was at odds with the perceived values of society at large—an image that some bikers, including the Hells Angels, then took as their model. The decades that followed saw pop culture saturated with iconography of rebellious figures clad in bicker jackets, often Perfectos—from James Dean, Gene Vincent, and Bruce Springsteen to the Ramones, Sid Vicious, and Mad Max. By the time of The Terminator‘s release in 1984, it was one of the defining symbols of disaffected youth, incontrovertibly associated with both the gang and the dangerous loner—as well as the leather sexual subculture that bikers had helped inspire. 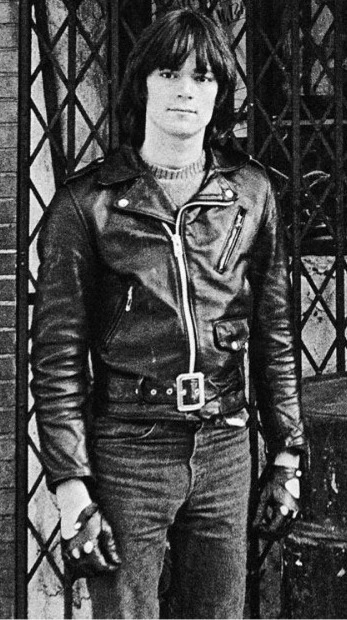 Memorably depicted in the beautiful artwork of Tom of Finland, leather culture penetrated the mainstream during the ’70s through the stylings of punk and metal bands like Judas Priest (whose Killing Machine includes the track Hell Bent for Leather). Priest’s lead singer, Rob Halford, did much to render gay leather culture visible in popular culture, and the Terminator, with its ridiculously hyper-masculine body and clothing, hums with the friction between juvenile power fantasy and homoeroticism. 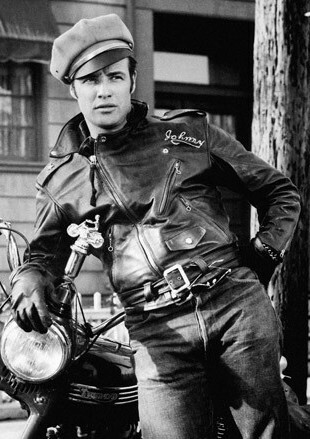 Yet, even as its outsider status was being consolidated, a parallel vision of the leather jacket—representative of a hyper-aggressive, buckled up masculinity straining at the leash to give vent to its violent urges—had been maturing in the psyches of the west, identifying the garment as a symbol of reactionary oppression, with wearers including the SS, the Luftwaffe, the Bolshevik commissar, and the motorcycle cop. A fascistic, authoritarian interpretation of men’s leather which perhaps achieved its perfect dream summation in the police robots of George Lucas’s THX 1138 (1971). As with the M-65 jacket, these two ideologically distinct yet conjoined souls give the Perfecto an oddly ambivalent power, as though it were inhabited by recursive nested boxes of reaction and rebellion: oppressor and oppressed, insider and outsider, law enforcer and law breaker both occupying the same aesthetic and psychological space. 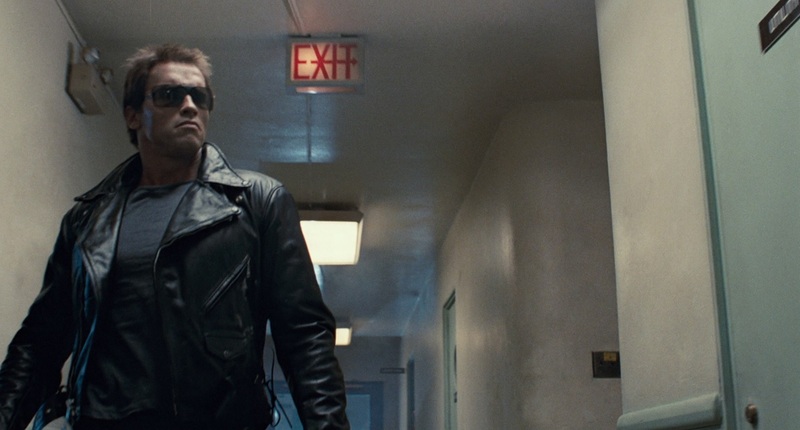 The third distinctive item of clothing we see the Terminator wearing are the sunglasses it dons after performing ad-hoc surgery on a damaged eye. These were produced by Washington company Gargoyles, and their antihero credentials had already been established in 1983, when Clint Eastwood wore a pair in Sudden Impact. Ironically, given the military-industrial complex themes underpinning The Terminator‘s storyline, Gargoyles was involved in a long legal battle against the U.S. Army when the company sued the United States of America for infringement of patent in 1988. 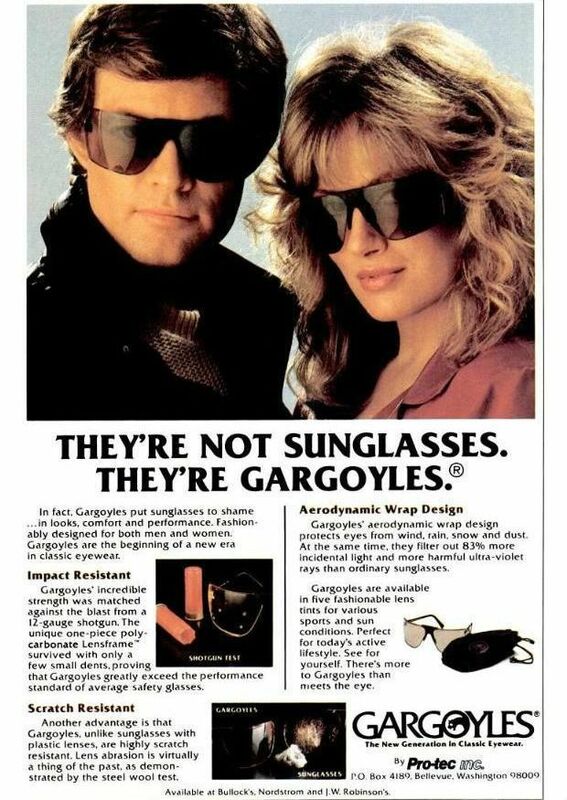 After commissioning Gargoyles in 1982 to create exclusive eyewear for combat and expressing satisfaction with the results three years later, the U.S. Army awarded the development of a contract for “Gargoyles or equivalent” protective spectacles to American Optical (whose name echoes that of Spectacular Optical, producer of Videodrome). 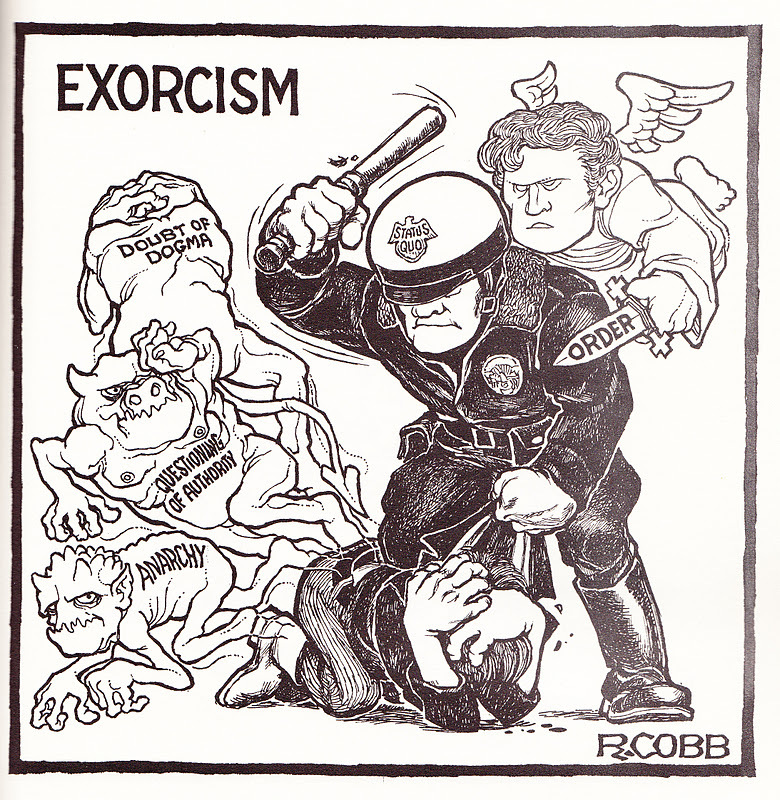 The evocatively named court case that ensued (Gargoyles Inc. v. United States) concluded with the court deciding in Gargoyle’s favor. Embodying an inherent tension between control and release—between authority, rebellion, and perceived ideas of freedom—the clothes the Terminator wears provide the perfect costume for a killing machine. Were they chosen deliberately by director James Cameron and costume designer Hilary Wright as a metaphor for militaristic authoritarianism reappropriating its symbols—symbols that had been appropriated in turn by the counterculture and by rebellious youth? Or, given the way history and fashion bleed into one another, was it merely an inevitable coincidence? Whatever the authorial intent, the Terminator appears clothed as the perfect envoy of a future fascistic dictatorship intent on rewriting history to legitimize its present: a child of his times, brutalized by war and clad in the uniforms of machismo in an ongoing, never-ending process of revolution and counterrevolution. Richard McKenna grew up in the visionary utopia of 1970s South Yorkshire and now ekes out a living among the crumbling ruins of Rome, from whence he dreams of being rescued by the Terran Trade Authority.